This hindware ezili new water purifier has a capacity of 7 litre with five stage RO+UV purifier. It has Power, tank full & purification indicator. This water purifier has table top and wall mounted. 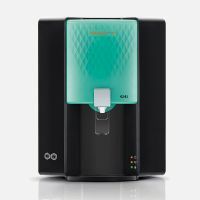 It's provides 100% RO and UV purified water. It has also comes with suitable for water with TDS up to 2000 ppm. To Recieve updates and possible rewards for Hindware Moonbow Ezili (Grey Blue) please sign in. To Recieve updates and possible rewards for Water Purifier please sign in.